1. Preheat oven to 350 degrees Fahrenheit and line a large baking sheet with parchment paper. 2.In a large bowl, beat the butter, sugar, salt, cinnamon, vanilla and almond extracts, and baking powder with a hand mixer until creamy. 3. Beat in the eggs, and stir in the flour until the mixture is smooth and slightly sticky. 4. Place the dough onto the baking sheet and form it into a log that is roughly 12” x 3”, and about ¾” tall. Use a wet spatula to smooth the top and side of the log and sprinkle it with the coarse sugar, pressing it into the log gently. 5. Bake the log for 25 minutes and remove it from the oven. Use a spray bottle filled with room-temperature water or a wet spatula to lightly moisten the log; softening the crust will make it easier to slice. 6. Reduce the oven temperature to 325 degrees Fahrenheit and bake the log for 5 more minutes, then use a serrated knife to cut the log into ½” slices. 7. Set the biscotti on its edge on the baking sheet and bake again for 25 minutes, until they feel dry and look golden in color. 8. 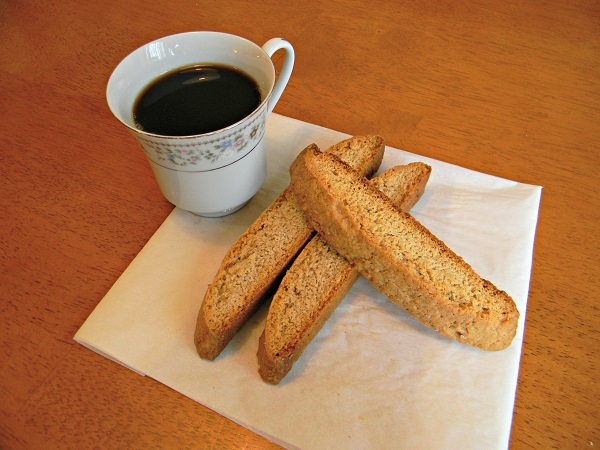 Remove the biscotti from the oven and cool on a drying rack; they will stay fresh for a few weeks if stored in an airtight container at room temperature. 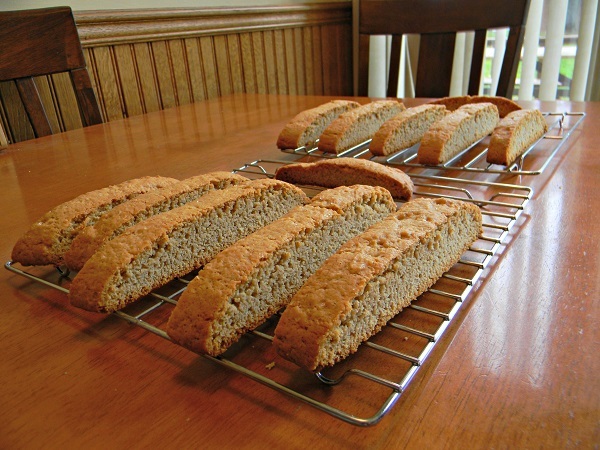 This recipe yields about 12 large-sized biscotti.